The Gist: A small town sheriff tells the story of how his town was over run by vampires. Painfully Awful: A movie so terrible that watching it actually hurts. These films are usually watched over the course of a week as to not drive me to a Joker level of insanity. Best example of that would be "Shower of Blood". Hilariously Awful: A movie so terrible that if the producer of the film actual understood how terrible the film was and decided to promote it as a film parody they'd be considered a genius (If you've ever seen Tommy Wisaeu's "The Room" it's that kind of terrible). This film is the latter example. I LOVED THIS MOVIE. Not because it was good because it really wasn't. As a matter of fact it was beyond awful but so much so that it reminded me of those Mad TV sketches where they hilariously mocked cheap looking blacksploitation films or late night bikini chick TV shows. You guys didn't own any black dress pants to wear for this film either eh? - Scenes of people having conversations that we could probably hear for ourselves if they didn't have some guy narrating over them talking TELLING US WHAT THEY'RE SAYING! In this scene Santa is concerned while Mrs Clause is angry with him. - Non existent film framing letting us know they might not really be where they say they are. When we're done killing vampires everyone come back to the "police station" for ICE CREAM! "Sir, don't you think we'd be more efficient if 911 calls weren't being forwarded to my CELL PHONE!" - Hot lady I'm pretty sure just walked by the park the movie was being shot in and in order to get her phone number they gave her a part in the movie where she basically mimed doing stuff which had absolutely no connection to the story whatsoever which I guess is ok because she completely disappears from the film after her scene. She was a cop, she was blond and she probably died I guess...yeah we'll say her character died, that works. - Not as hot but still kinda cute lady who probably did the same thing who's character seemed to know she was important to the plot of the film though the watching audience had never seen her before who tragically died during her first scene which would be a surprise and really sad had we known who she was. I just got in a fight with a vampire and there's hundreds more. Let me find the nearest creek to randomly pose in my undewear. 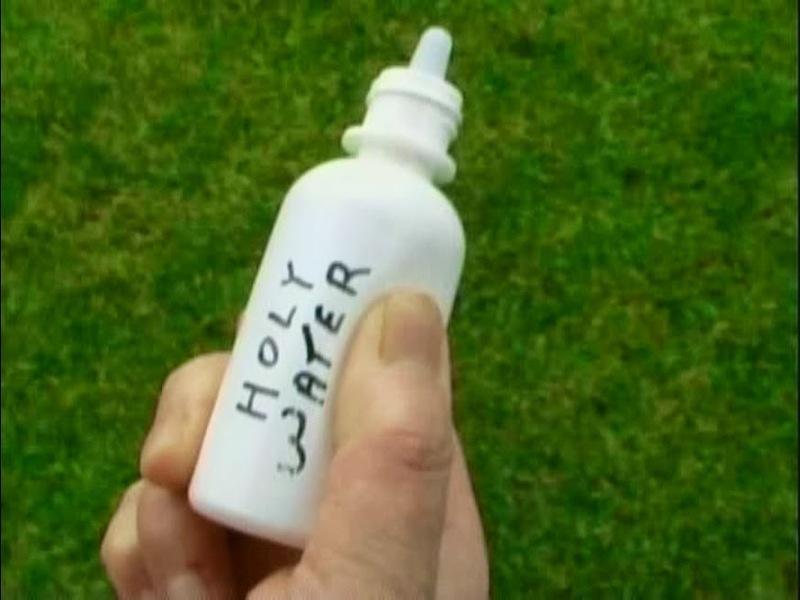 Ha vampire you thought this was contact solution but it's really HOLY WATER...SEE, IT SAYS RIGHT HERE! Female Vampire Factor: I don't even know why you've made it this far. That should have sold you the movie right there but if you're still looking for chicks with fangs then yes, they're here in abundance, chicks with fangs, $13 scarecrow subtle glow fangs. As far as the main characters go producer Carl Merritt pretty much gives you all their good fangy scenes for free on Youtube. This clip set includes (SPOILER ALERT) officer "Layla" (Manda Webster) with her regulation EMT half shirt, underwear and knee high boots that she wears on duty. The only one they don't give away is SPOILER ALERT officer Marcia Lewis (Sherri Foxx) who also gets turned. It gets a Vampire Beauty Rating of 4 out of 5 with only the cruddy film quality keeping it from a solid 5. 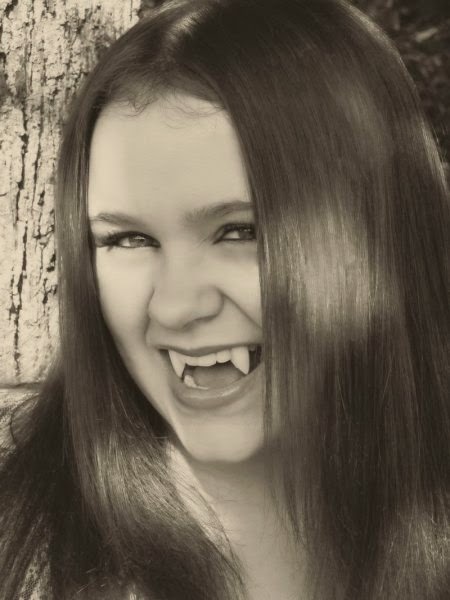 If you get the DVD you also get some decent pictures of Nikki Irene (who plays a random vampire in the film but her one scene gets a lot of screen time) with fangs posing as well so there's a bonus. If I haven't sold you on this film either you don't have a sense of humor like mine or you like really good movies.